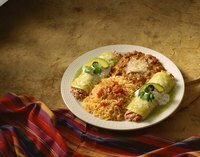 Authentic Mexican enchiladas are a dish consisting of corn tortillas rolled up with filling, such as cheese, beans or meat, and topped with a pepper-based sauce and cheese. Since the corn tortillas are both filled and topped with numerous ingredients, they risk becoming soggy. To make them sturdier, you can fry the corn tortillas in oil before filling them. The oil makes the tortillas more flavorful and gives them a harder texture so they can withstand the ingredients and remain firm; however, very lightly fry them or they won’t be pliable enough to roll. Pour 1/4 cup of vegetable oil into a large skillet on your stove top. Make sure the oil is approximately 1/4 inch deep—or the oil won’t be deep enough to evenly fry the tortillas. Set your stove to “medium.” Heat the oil until it starts to slightly ripple, about one to two minutes. Line a platter with a paper towel. Place a corn tortilla directly into the hot oil and fry it for about five seconds. Flip the tortilla over with tongs and heat for another five seconds. Transfer the fried corn tortilla onto the paper towel-lined platter. Repeat the process with the additional corn tortillas. Place your preferred enchilada fillings into the center of each fried tortilla. Roll each tortilla around the filling, then position them on a serving dish, seam-side down, and top with your preferred type of cheese and enchilada sauce. Dip each side of freshly fried corn tortillas briefly into warmed salsa or other pepper-based sauce to very lightly coat each side—it will give the enchiladas even more flavor. Never use high heat for frying corn tortillas for enchiladas because the high temperature will make the tortillas too crunchy and more like tortilla chips. Do not bake the enchiladas after filling and topping them if you want truly Mexican enchiladas—only Americanized enchiladas are baked. Dig in to these hearty and flavorful chicken enchiladas with a homemade red or green sauce. It'll be a definite crowd-pleaser!